following a few simple guidelines. 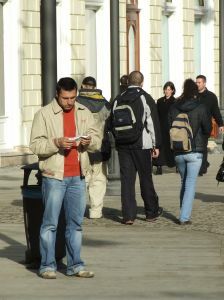 Gospel or Bible Tracts are simple to use and are a great starting point for conversation, no matter your experience level. Whatever name they go by, these wonderful little booklets and leaflets can be used as conversation starters. They give you something to focus on in your conversation and if designed properly, also will provide you with an organized way to present the Gospel of Jesus Christ. Many people are shy, at first, about beginning conversations about the Lord. These little booklets give you something to focus on, helping you to overcome shyness and build confidence in witnessing. Whether you are brand new to witnessing or an experienced soul winner, these little tools can be a valuable resource. In order for you to get the most out of the materials that you use, you must learn to properly evaluate their content. The points listed below are things that over the past 20 years, I have found to be most helpful and effective when evaluating materials to be used in witnessing to others. These guidelines are not "written in stone," but by including these pointers in your selection process, you will increase your chance of success in using this method of sharing Jesus with the lost. * Does it use Scripture Verses to make a point? * How can I start a conversation with this material? * Is it short and to the point? * Does it truly offer a starting point for non-believers, including a prayer? Take a look at tract materials on the internet and at your church that are designed for sharing the Gospel with others. Ask each of the questions in the "Questions To Ask" section of this web page. Take your time to evaluate the content. It will make you better able to discern for yourself which materials you can use and which are better suited for someone else or for a different purpose than evangelism. I have created a resource for you to use in sharing the Gospel and encouraging others to do the same. "3 Essentials for Christian Living" is designed as an extended tract. The book covers the concepts of Birth, Growth and Reproduction in relation to our spiritual walk. We must be born into God's Kingdom, Grow by prayer and study of God's Word and Reproduce ourselves as Christians by sharing the Gospel with others. Please do not hesitate to contact me with questions or comments about this topic. Click on the Contact Me link below.